Coconut flour is a great gluten free alternatives to regular wheat flour! Coconut flour is made by pressing the oil and water out of the meat of a coconut and then grinding the fiber that is left into flour. The result is a light, kinda clumpy flour. 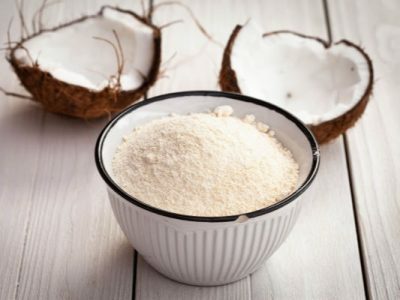 Why should I use Coconut Flour? It’s low in carbs (6.4%), really high in fibre (13.7%) and contains no gluten or transfats. Due to its high-fibre content, coconut flour doesn’t spike your blood sugar as quickly as grain-based flours. A study published in the “British Journal of Nutrition” in 2003 found that substituting coconut flour for some of the wheat flour in traditional baked goods lowers the glycemic index – the measure of a food’s impact on blood sugar – of the finished product. There are loads of recipes out there that use Coconut Flour – you’ll find a bunch of them here. You can also just substitute out some wheat flour for coconut flour – 20% is a general rule of thumb. And they say that you should add an equal amount of water to however much coconut flour you add. It is possible to just use all coconut flour instead of wheat flour, but this can get a little tricky… and involves adding extra egg / liquid. Takes practice, and patience… best off looking for a recipe made especially for Coconut Flour. Coconut Flour Ingredients: 100% Indonesian Coconut. Allergens: Note that ALL our products may contain traces of peanut, soya, sesame & other nuts.